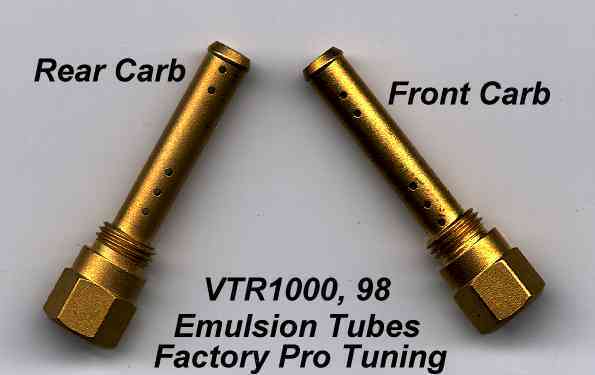 Have you removed or disabled the PAIR valves? Sounds more like it's lean to me. So lean that it doesn't fire, when the throttle is closed. This dumps a bunch of unburned fuel and air into the exhaust system. When it does fire, it lights it off. what did you set your tps at? what color are the pipes when you look at them from the rear. preferably with sunlight? try pulling you choke out and see if it happens. thats possible. i didnt get to check the pipes, i do find that the bike doesnt like cruising in 6th gear, gets a little chuggy, and 5th at times aswell. im gonna check the plug on it tomorrow or later tonite if the motivation sets in, i just didnt want to burn my hand checking it when i got home. yeah set the tps 490-500, raise the needle. what jets, air mix? Steve29s wwas acting similar and we got his to stop by messin with above three things. i cvant remember what the carbs are set like off the top of my head. ive got that drilled 45 in there and my 48 showed up. 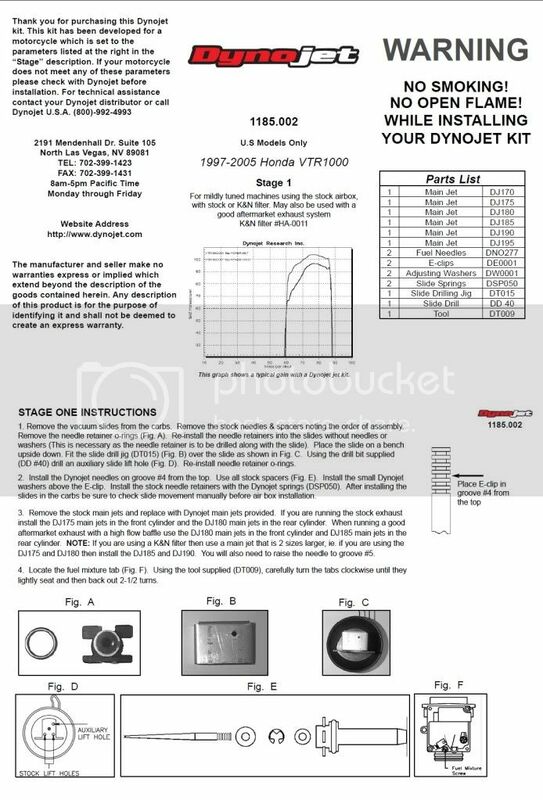 i bought a jet kit from here from a guy who bought it used from another guy and along the line it lost the 188 jets and the 48's. so my 48s are here now just need to get them in, the needles been shimmed so its likely gonna have to get un shimmed. i noticed the bike would get a little chuggy at cruising rpms and my buddy who was behind me on his vfr said he could hear it chugging and when id roll into the throttle a good bit it would blow black smoke for a second and then pick up and go. so either its running rich as im suspecting because of the tps adjustment and the already shimmed needle. on a positive note he said my bike pulls like a raped ape, his vfr800 has a leo vince exhaust and -1 sprocket and he said he cant hang with me at all. said he'd need to go up one in the rear and drop about 75 pounds, lol. so thats nice cause last year when he had the exhaust we were dead even everytime. quick tps related question, i dont wanna start bending tabs to **** and from the writeups i havent seen what you guys are doing to bend the tabs, do you happen to have some pictures or a better way of doing it? Alright. Well its definatly not running rich. Not the front cylinder anyway. I yanked the plug. It looks decent. A little on the lean side but not super lean like I thought it might had been. So unless the rear plug is the exact opposite of this, which it could be, I don't think I'm too far off from the bike running decent. looks pretty good. Like you said maybe a little lean dependent on how hard the bike was run before you shut it off. But definitively close to right. I tried to run it hard and shut if off and coast her into my driveway. Do I have to yank the tank to get to the rear plug? I wanna check it to make sure both cylinders are running close to eachother. Take the front tank bolts out then remove the rear bolt and use the u-shaped tool in the tool kit (if you have it) to prop the rear of the tank up. You can reach the rear plug from there no problem. No need to disconnect any hoses. also plugs on the superhawk are hard to fowl by design and gas nowadys doesn't tell the same story it used to. Often times in my experience the hawk will miss fire if mix is off very much either way and when things don't fire the gas goes into the exhaust and pops so backfiring could be either lean or rich. Don't assume that because of an aftermarket exhaust that you need to go even more rich. On Springbubba's hawk we thought it was lean missing so we richened it and it made it worse so interestingly he is running leaner the stock now and he as aftermarket pipes. Pull the choke during the same conditions, if it runs better your lean. 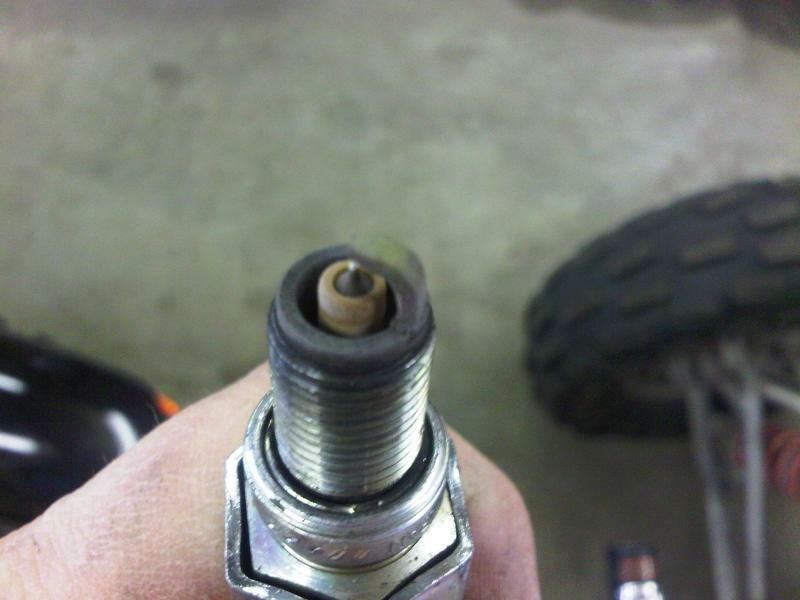 Ofcourse, don't go riding around with the choke pulled for too long, that's a good way to put a hole in a piston. ill try the choke thing next time im on the bike. i was wondering what the hell that weird u shaped thing was, i was looking at it the other day thought someone might have tossed it in there as a joke somewhere down the line of owners, lol. uch, get over that pulling the tank thing. Use a small ratchet strap to lift the front of the tank to about 45 deg. There's a pic of this somewhere on here and it's a great time saver and facilitator, and it's easy and stable. Better to not have your tank topped off for obvious reasons. You can pull the filter box carbs, sync carbs whatever and we got the rear plug out of steve29s with the right socket/extension, but it is a little tight. seriuously, i think you're better off changing needle setting, air mix, tps and enjoy the trial and err method. I've had it up a lot. I've got a 2x4 I've measured and cut to use as a prop rod. Lol. Even says bike prop rod. Do not burn. Haha. That's funny...I still have a piece of 2x8 in my garage with "BMW stand" lettered on it. My old '83 R100RS had a "ride off" center stand. You could just click it into gear and ride off the center stand, but you couldn't pull a wheel. So I'd put that chunk of 2x8 under the center stand to get the rear wheel off the ground. Ok. So here's what I discovered. Now its been cool on every ride I've been on so the bike hasn't gotten past 80 degrees. 104 its as hot as it'll get. So usually its around 96 or 97. Anyways. 4000 rpm 6th gear it would start to chug a bit. I pull the choke a little and she clears right up. But when it hit about 102 degrees at a red light it was feeling chuggy and when I pulled the choke it got worse. Although when its at a cooler temp its idleing fine and is responsive. So yeah I'm not sure where to start with it. Last edited by residentg; 05-01-2010 at 04:07 AM.